Well, the good news is one of my posts made the top 15 and is published in the guide by Brighter Planet. 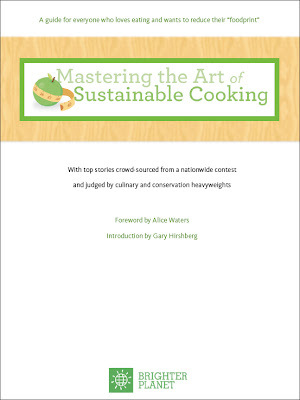 It was reviewed by a panel of judges that included Alice Waters! You can download the Sustainable Guide with some good information on our "foodprint" and the top 15 posts here. While traveling in Arizona, we ate lunch at a funky place called Wisdom Cafe. It had been a frustrating little road trip, with the kid at her worst. Which, I know, compared to a lot of other kids is not that bad. Still. During an excursion to the bathroom in which I am sure 10 or 15 people probably waited outside the door to no avail, I found myself nagging the kid, again and again. "Honey, DO NOT put your hands on the toilet seat, then put them in your mouth." Then, minutes later same. Same. Same. Now that the kid has likely wedged every germ in the known universe, or at least that bathroom, into her mouth, I finally look at her and sigh. "Why do you not listen to me, why?" "I listen, but Mom, there's just so much going around and around in my head ... I just forget." I get it. And I get where she gets it from. Me. Except for that part about the toilet germs. I have no idea where she gets that. 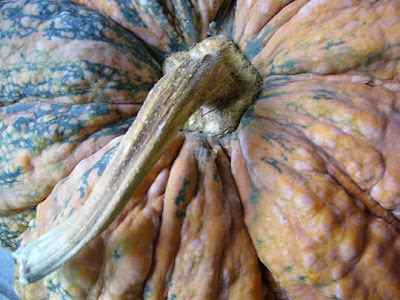 With its gnarled, thick rind, this heirloom pumpkin looks like anything but something to eat. It's not often you find yourself in the kitchen, staring at an ingredient, trying to figure out an attack plan. Usually this moment only comes confronting your food when it is still running, or pinching. Take a deep breath. Get a sharp knife. A big, heavy, ugly beast. Thump. Right there in front of you. Take a moment to size it up. Look at the angles. Then take your first cut down the deepest seam. Take your next cut down the opposite side. 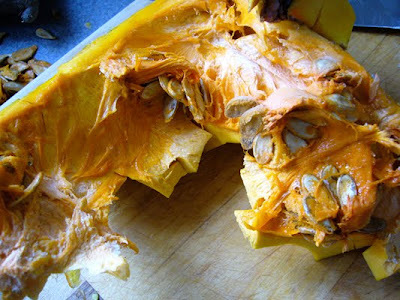 Turn the pumpkin over and make the cuts meet at the bottom. Grab the thing and pull it apart. You just got it down by half and all you had to do was start. 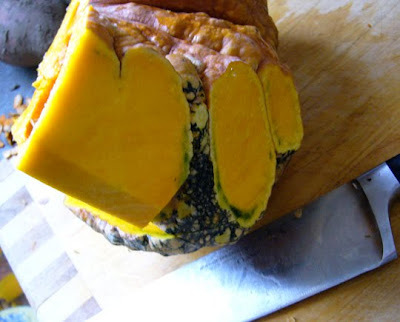 From here, the goal is to slice away the rind, a bit at a time, where you can. When you get a piece cleared, cut it off into cubes. Slowly, piece by piece, you get there. If you hurry, you'll get hurt. It's not a race. More of a test of patience. And not unlike any other problem in life, really. If you work at it, take it piece by piece, sooner or later, you'll get it down to size. Finally, save the seeds. Compost the rest. Use everything wisely. I think about these things in the kitchen. Even when I am just cutting a pumpkin. Heat oil in a large Dutch oven. Add the celery, leek, onion and sweat for 10 minutes over low heat. Add the thyme, pumpkin and sweet potato and the 6 cups of stock. Bring to a boil. Turn down to a simmer and cover. Simmer for about 30 minutes until the potato and pumpkin are soft. Puree with a stick blender. Swirl in the butter and half and half to add richness. Salt and pepper to taste. Add the crab meat and mix until heated through. Serve with grated Gruyere or Parmesan on top. 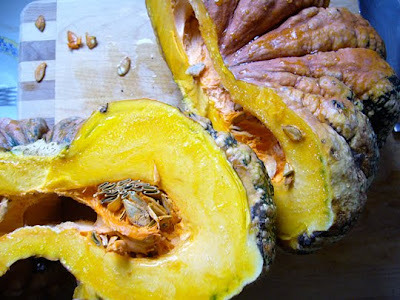 Have to admit, this is not the best recipe for Pumpkin and Crab Soup. John Besh has a better one, I think, in his My New Orleans one. It uses twice the crab meat amount (and the big lump kind that costs twice as much) and double the amount of real cream plus garlic and cayenne to keep it Cajun. Very tasty. Still, this lighter approach is pretty good, especially when you are on the New Year "eat better" track. For now. Outside my door is a frozen wasteland and below zero temperatures. It's enough to keep you inside all day looking for a reason to turn on the oven. It also makes me dream of warmer days such as our holiday trip to the Arizona desert. The irony is, of course, that many folks think the desert is an empty wasteland. I found it the opposite. Rugged, beautiful, with vast wide open space that let my soul breathe. We also found a lot of unique foods that can't be found anywhere else. On a Christmas day walk — yes, it was warm — we stopped by neighboring yards and did a little "ultra-local" free harvest of citrus. My mother-in-law loaded my backpack with four cups worth of calamondin limes for preserved limes. Calamondin limes look like tiny oranges. 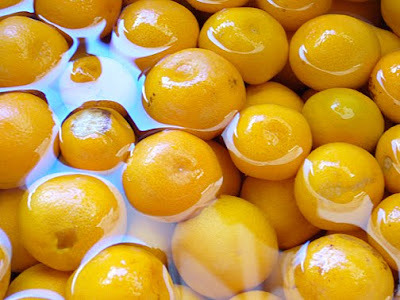 They are a cross between mandarin oranges and a kumquat. 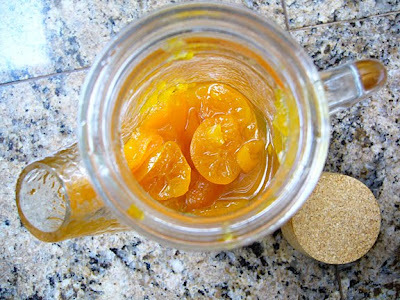 Think tangy orange with very thin peels that can be eaten. Once we got home, the first step was to give the limes a good wash. After that, slice them very thin, peels left on, removing the four large seeds in each. Then, boil the limes in a sugar syrup for 45 minutes. If you are going to preserve them, you'll need to have sterile canning jars, lids, rings and a canning pot to boil the filled jars. Here are some instructions on canning. Bring the water and sugar to a boil. Add the limes and boil for 45 minutes. Can the preserves if desired. These are delicious on toast or a topping for gingerbread cake. The recipe that kicked around in my head while sampling them would be a nice dark chocolate crepe with the preserved limes for topping. We brought back a few jars so I can try it. Perhaps while looking out at the snow. Prickly Pear Cactus, we found syrup and marmalade made from prickly pear fruits called tunas. The pads of the cactus are also edible, known as nopalitos. I also was lucky enough to stumble into a used book store and locate an out of print cookbook, Fruits of the Desert, that describes all the ingredients native to the Sonoran desert and how to cook them. It will be great reading on these cold days. There are a lot of other edible cactus and desert foods that are covered in the book, plus the locally grown citrus and pomegranates.